Special flickering light bulb reminds us of an old fashioned gas light. Holly leaves are cut from 1/4" plywood and holly berries are made using pre-drilled wood balls which are attached with a short dowel. Stands 57"H. Plans drawn FULL SIZE. 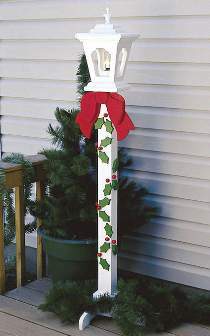 #1072 Light-Up Lamp Post Hardware Parts Package includes 6 ft. wiring harness, frosted flame tip bulb, wood finial, pre-drilled wood balls for holly berries and dowel pin stock to attach berries. Project plan, remaining wood and paint are not included. #1074 Special includes #W2097 Plan & #1072 Hardware.